L-Tron announces the second edition of its popular one-day Forensic Photo Refresher Course scheduled for Thursday, December 6th from 8:30 a.m. until 4:30 p.m. Hosted by the Brighton Police Department, the event is open to active members of Law Enforcement at a cost of $95 each; lunch, coffee and breaks are included. The training will take place at the Brighton Fire Department Headquarters at 3100 East Avenue, Rochester NY 14610. For more information on what you will learn, read our list of Forensic Photo glossary terms here. This course is also approved for ACTAR and IAI CEUs. 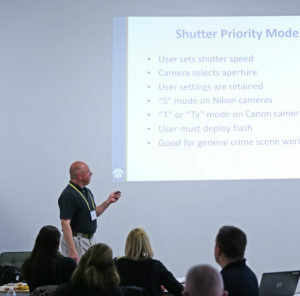 Attendees of the course will learn about the growing presence of 360-degree photography for crime and crash scenes – a technology L-Tron simplified with OSCR360; which captures 360-degree spherical photographs and incorporates them as “containers” for digital evidence into courtroom presentation software. Leading the course is retired Monroe County Sheriff’s Deputy and police instructor Andrew McNeill. Now, L-Tron’s Director of Forensic Education, McNeill, an ACTAR-accredited collision reconstructionist and certified senior crime scene analyst, has testified as an expert witness at the town, county and state court levels. He has conducted forensic photo and crime scene technician training courses for more than a decade. He assisted the NYS Division of Criminal Justice Services in developing its Basic Investigative Photography and Police Crime Scene and Evidence Specialist courses. He holds a Master of Forensic Sciences degree from the George Washington University. In business for more than 43 years, L-Tron is a data capture solutions company serving the government, manufacturing, industrial automation and warehousing industries. L-Tron works with hundreds of Law enforcement Agencies across the country, and has done so for close to 20 years. 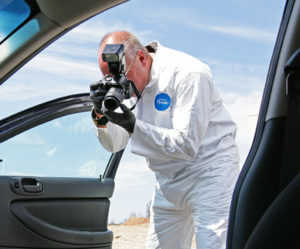 Seating is for the forensic photo course is limited; to register, call Julianne Pangal at 800-830-9523 ext. 115 or visit www.L-Tron.com/course. Questions? Interested in learning more about our Forensic Photo Course?